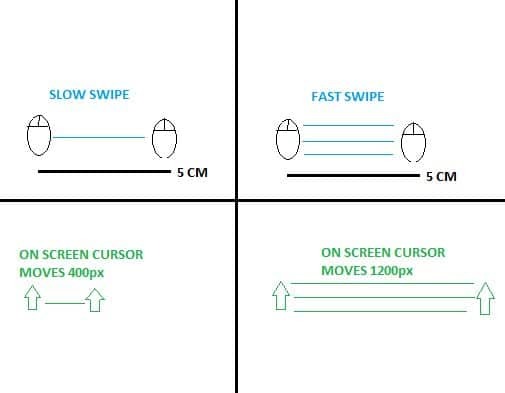 Mouse acceleration (or ‘mouse accel‘ for short) is when your cursor in the game moves further depending on how fast you move your mouse on your desk. This is generally considered to be a big no-no for gaming mice (gaming mice should be as ‘raw’ as possible when processing movement) though some professionals (for example swag from CSGO) like to turn on mouse accel on the software side. As mentioned above; not everyone is in full agreement that mouse acceleration is necessarily a bad thing, although most gamers seem to agree that it is something to avoid. While some people might like mouse accel and turn it on in their (ingame) settings, a good gaming mouse should never have built in acceleration which can’t be turned off, as the majority of gamers will not want anything impacting their aim. Having good, precise aim in any game is all about muscle memory. Those guys that you see racking up the crazy headshots game after game have been practicing and honing their aim for dozens upon dozens of hours, and most of the insane flicks that you see in montages aren’t really done ‘consciously.’ Yes, the player makes the decision to try and shoot that enemy player who is now the unfortunate victim in a frag clip, but the actual blink-of-the-eye movement that you see is done pretty much automatically. That’s because, after hundreds of hours of practice, your brain and body knows exactly how far to move your mouse to reach a certain spot on the screen. You’ve done it so much that it’s become ingrained in your system. Think of having great aim like riding a bike; yes you have to be conscious and pay attention in order to not fall over, but the actual process of moving your feet on the pedals comes naturally, without thinking. It’s the same with aim. That’s why it’s recommended to not change sensitivity all the time, and why it may take some time to get back to your regular skills if you get a new mouse (which can be heavier or lighter, thus messing with your muscle memory) or something like that. If you want your aim to be consistent, your mouse should be too, and if you’re playing with mouse acceleration on it’s simply not going to be consistent. You no longer only have to take the distance that you move your mouse into account, you also have to think about the speed at which you’re moving said mouse. That only adds another layer of difficulty, and it’s very hard to get your brain and hands properly ‘tuned in’ when using mouse acceleration. As mentioned before; some people (even professional gamers) do like having mouse acceleration turned on, but in general we recommend to steer away from it.